Photo Credit: Creative Commons - Planet_Q! I have to confess that I suffer from a disorder that currently has no cure. It’s a haunting problem that few people talk about. But I’m breaking my silence. I have coulrophobia – an acute fear of clowns. While this may not have the same high-profile cache as other phobias such as fear of water, heights or overly-hairy women it is a real disorder and not a laughing matter. In an effort to face this fear, I’ve compiled a list of the Top-10 Creepiest Clowns Ever. In addition to this “confrontation therapy,” I’m also writing this blog while dressed as Emmett Kelly Jr. to maximize the effect.This type of therapy is challenging. Tears are streaking the grease paint on my face and dripping down to the water-squirting flower on my lapel – but I will endure. This blog is a safe place for me, thank you for your support. Here’s the list…. 10. Krusty the Clown – this character from the cartoon series the Simpsons is not really scary because he’s pretty funny. Yet being a clown, by definition, makes him terrifying. Such is the irrationality of my phobia. 9. Any Sad-Faced Clown – I’ve never understood this idea. Clowns are supposed to be funny and the cognitive dissonance that results from grief-stricken face paint merely amps up the creep factor for me. 8. The Drunk, Mouse-Driving Clown from Uncle Buck – this movie portrayal creeps my out because the clown shows up to the kid’s birthday party stumbling drunk, yet still believed he could entertain kids. Bonus points for Jon Candy’s paternal instinct to punch the clown right in his squeaky red nose. 7. Ronald McDonald – I know this clown is beloved by children around the world because he makes fried, overly-processed foods fun but it’s the ubiquitous nature of this persona that gives me the willies – you can’t escape this clown! 6. 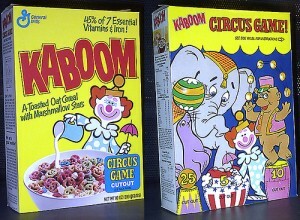 The KABOOM cereal Clown – this was the first clown [see photo insert] that gave me nightmares and then the horror was reinforced when I had to choke down a bowl of his sugary coated face when I woke up in the morning – taunting me with each frosted bite. 5. Charlie-in-the-Box Clown – now this character was one of the misfit toys in the Rankin-Bass production of “Rudolph the Red-Nosed Reindeer” which was and is a Christmas classic. In and of himself “Charlie” was not scary, but after I heard Charlie speak – that became the voice of the aforementioned, uber-creepy KABOOM clown in my nightmares. 4. Clarabell the Clown – this is an old-school clown from the Howdy Doody Show in the 1950’s that was re-introduced to my generation in the mid-70’s as the New Howdy Doody Show. The creepiest part of this guy was that he couldn’t talk and there was no attempt to use American Sign Language to communicate with anyone. That coupled with his freakish makeup – didn’t work for me as a kid. 3. The stuffed Clown from The Poltergeist – these are getting really creepy now. This toy clown came to life and dragged the unsuspecting little boy under his bed. He beat the stuffing out of it – literally – but that image still lingers. 2. Pennywise the Clown from It – Stephen King released his book It in 1986, which then became a movie in 1990. Tim Curry was perfectly cast as the demonic, murderous title character. As a result, Pennywise and any bozo-resembling clown still makes my skin crawl. 1. Pogo the Clown – this was the persona that real-life, serial killer John Wayne Gacy used to identify and ensnare his young victims. This is an irredeemable blemish on the painted face of clowning and clownology. To be honest, writing this list didn’t make me feel better. Clowns are still creepy. So, if you’re having any kind of celebration, parade, fundraiser or kid’s shindig where clowns will be present – I won’t be. Question: What are your feelings about clowns? I'm an ex- journalist, current PR guy, husband, dad, marathoner and blogger with more than 20+ years writing experience. Sometimes my stuff is funny - at least that's what my 6-year old tells me. I also have a mild case of coulrophobia - trust me that is not a laughing matter. I blog at http://www.thedailyretort.com. Tor, I think I look like Ronald, with the hair anyway, so he is really scary to me. That Poltergeist clown should just be thrown away and not heard from again. You know, I didn’t write about it BUT I almost did a separate post on clown hairdos – paying particular note to the fact that Ronald is the only one of the clown posse with a full wavy head of hair. All the other clowns have wispy patches that suggest repeated vacations to Chernobyl – which adds to their creep index. You may feel that Crusty the Clown isn’t scary, but I bet Bart would have a different take! I have seen Crusty look scarier than most of the clowns on your list. I just hope you were listening to Smokey Robinson singing “Tears of a Clown” while you wrote this! Hah! I love Smokey – that song alone probably would have cured me 😉 Awesome comment Mike!!! Clowns were never a big deal to me. I just kind of thought they were silly. I can see, though, how the image of a clown could be terrifying to some kids, and how that can last into adulthood.